← In the struggle against terrorism what hope is there for free-speech? With the Feast Of St Michael and all Angels on 29th September (St Michael, St Gabriel and St Raphael in the current Roman calendar) the thoughts of those of us who were trained as Anglicans for the priesthood at the House of the Sacred Mission, Kelham (near Newark-on-Trent in Nottinghamshire) turn to the place of our formation. True, there are an ever dwindling number of us, for the House closed in 1972, although some training continued for several years afterwards. There was a time when to say that you were trained at Kelham brought an immediate look of recognition – if not always of approval. But over forty years on there will be many Anglicans – and many more Catholics – who know nothing of its history and its unique approach. In an earlier post I wrote something of the genius of Fr Herbert Kelly, the founder of the Society of the Sacred Mission, a religious community in the C of E dedicated to the training of clergy. Yet as we begin to re-assess the years since the Second Vatican Council, and to re-evaluate much that disappeared in the 60’s and 70’s, perhaps Kelham and its method might be part of this process. The Apostolic Constitution Anglicanorum Coetibus makes provision for distinct seminaries within the Ordinariates; perhaps there is something in the Kelham way which might be of both spiritual and practical value: a genuine part of the Anglican patrimony. I knew nothing of Kelham when, in August 1968 I received notification of my disastrous ‘A’ level results: a C (in English), an E (in Religious Knowledge!) and another ‘O’ level pass (in Latin) I was already pursuing my vocation, but had expected to go to University. Against the advice of my teachers, I began to look at other possibilities, and spent a few days with the Kelham Fathers. The students were all on vacation, and the thirty or so brethren were rattling around in the vast buildings (which looked like St Pancras Station) which combined monastery and theological college. I fell for the place, hook, line and sinker, was offered a place and started there in September 1968. Fr Kelly had not really intended to start a religious community, but rather to train men for the new Korean Mission. Quite quickly he took up training priests for the Church in England, and formed a community of priests and lay-brothers as the best way of doing it. He himself was a bit of an academic failure, and he thought that the clergy of his generation spent too much of their time studying theology in the atmosphere of the universities. He viewed the move of the Bishops to restrict ordination to graduates as very foolish. But he was quite sure that men from non-academic, ‘working class’ backgrounds needed a formation which was demanding and rigorous: he aimed to teach his students to think, to do their theology, and not just to learn a series of ‘correct’ answers to be trotted out in sermons. So the life he created was all-embracing: Mass and the daily Office, lectures, housework, manual work – even sport – all were part of the day to day life of the College. Students lived alongside the Community, not in a separate building, and the Kelham way often saw senior tutors sweeping corridors and washing up under the direction of their students. The day began at 7am with Morning Prayer, followed by twenty minutes of silent prayer and meditation, and the Mass. Breakfast was normally eaten in silence and was followed by housework. For this both students and brethren were divided into three groups: Domestici cleaned the common rooms and corridors; Cibarii were responsible three times a day for serving meals and washing up (the Community employed a cook in my time); Sacristani cleaned the chapel and looked after the sacristy. Each of these groups was overseen by a Magister (a student or the Novice Sacristan) , and the particular jobs were defined and described on a series of cards. Although this level of organisation sounds rigid to modern ears it had the great advantage of telling you when you had completed a job: it was in fact very releasing for a worrier like me to know that I hadn’t forgotten this or that! The rest of the morning allowed for two study periods or lectures and seminars. After the Midday Office and a light lunch, the weekday afternoons provided three Houselists, heavier jobs including the maintenance of the grounds, and the shovelling of coal for the furnaces (for which Kelham was renowned); one afternoon of sport (football, tennis, cross country running) and one free afternoon. After tea Evensong was sung every day, followed by an evening study period. Dinner was the main meal of the day and was substantial. 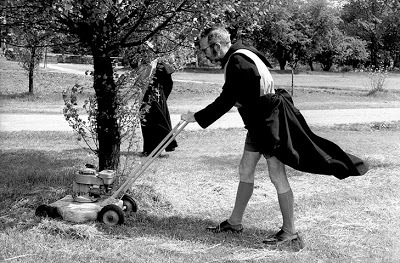 There was time for recreation, although television was never especially popular, with Compline at 9.45. The Greater Silence began after Compline and lasted until after breakfast. 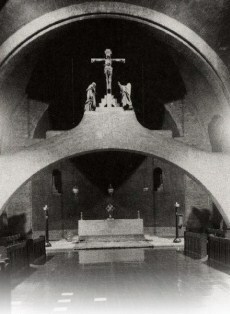 On Sundays there were no lectures, and the High Mass was fully sung and later. Evensong was solemn, and groups of visitors often joined us for tea and the service. This pattern was repeated week in, week out, with Saturday afternoon free (but only enough time to get as far as Newark). Each half-term there was an exeat (between Mass and Compline) and during one these I paid my first visit to the shrine at Walsingham. What was it about the Kelham method or way that so gripped me and others? The ‘Catholicism’ of Kelham was sometimes dismissed by the rest of the Movement: certainly it was independent (it produced in all its years only one diocesan Bishop, I think) but it was not ‘liberal’. Radical Catholicism is a better description. And I need to remind people, as I pointed out in another post, that the whole of my class is now Roman Catholic. Certainly I came to believe while I was at Kelham that the future of the C of E (and of the Anglo-Catholic Movement) lay in a renewed Catholic theology and life. Theological thought and discussion was to be revelled in, not treated with suspicion, for it led to a deeper orthodoxy, not to a trivial liberalism. But it led to a Catholic orthodoxy which could be argued for in terms which modern men and women could engage with. There was growing criticism (which perhaps contributed to the closure of Kelham, though there were many factors, both internal and external) that the Kelham system took young men and shut them away: what they needed was time in the ‘real world’. How easily my generation bought into that way of thinking! But the ‘real world’ was increasingly a world trying to live without God. It was a world which rejected the accumulated wisdom of generations of civilisation – and generations of faith. It was a world which misunderstood the whole notion of human freedom. Thus the life at Kelham had about it a richness – indeed a ‘reality’ – which made it attractive and fulfilling. In place of personal achievement, competition and self-fulfilment, it put at the centre life lived according to the will of God. Ad gloriam Dei in eius voluntate (To the glory of God in his will) is the SSM motto. It is an idea in the working, and most of us spend our lives working out the truth of such living. And although the life was simple, at times stern, I found it a place of immense kindness, serious and yet full of the humour of the absurd – no-one who took themselves too seriously could have survived. When, after my Catholic ordination, I embarked upon the two year course of studies prepared for us in the Ordinariate, I was rather nervous. Could I read conscientiously and write essays again? Half way through I am enjoying it enormously; I am back at Kelham again, thrilled by the refreshing waters of renewed orthodoxy. It is wonderful, in semi-retirement, to have the time todo it, and to enjoy it. The liturgical life and the music of Kelham I have hardly touched on. Perhaps another post might be of interest to some people; and a few thoughts about what we might learn for the formation of clergy today. Formerly an Anglican priest (ordained 1975) received into the Catholic Church in February 2012, and ordained to the Diaconate on 27th July 2013. I took early retirement, and divide my time between London and northern France. I am deeply committed to the Ordinariate as a gift of the Holy Spirit in the search for unity. Like many Ordinariate members I feel a personal gratitude to Pope Emeritus Benedict, together with loyalty to our Holy Father, Pope Francis. My blog tries to make a small contribution to the growth of the Ordinariate by asking questions (and proposing some answers) about the 'Anglican Patrimony'. I have always been fascinated by the whole issue of growth and decline, and therefore concerned for appropriate means of evangelisation in western Europe. I believe that the Holy Spirit is constantly renewing the People of God and that we must be open to him. My love of music and motorcycles will occasionally surface in my posts. On Saturday 19th October 2013, I was ordained to the Priesthood at Most Precious Blood, Borough, by the Most Revd Peter Smith, Archbishop of Southwark, for the service of the Ordinariate of our Lady of Walsingham. I continued to serve the Ordinariate group and Parish at Most Precious Blood until the end of 2014. Subsequently, I helped in the care of the Ordinariate Groups at Hemel Hempstead and Croydon, and in the Archdiocese of Southwark, until the beginning of September 2015. With the agreement of my Ordinary, Mgr Keith Newton, the Bishop of Amiens appointed me Administrator of the Parish of Notre Dame des Etangs (Pont Remy) in Picardie, France. This appointment is to last for a year, to give the Bishop the opportunity to assess the future of the parish. This entry was posted in Uncategorized and tagged C of E, Catholic, Christianity, church, clergy formation, clergy training, Kelham, priestly life, religious life, Society of the Sacred Mission, theology. Bookmark the permalink. A beautifully written article Father Scott, about a beautiful place. 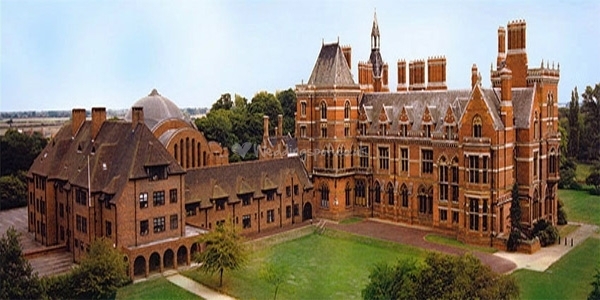 We live half an hour’s drive away from Kelham and my Wife and I regularly visit Kelham Hall. It is not only a wonderful building with grounds to match but we also visit the SSM graves there. The Priest who married my parents is buried there so I feel some attachment to Kelham. Thank you for this. It strikes me that should the ordinariate be in a position to establish a house of formation, it is exactly this life that it should model because it inculcates the most important interior discipline: routine. Regularity of prayer, of study, and of recreation are vital, and the contemporary Catholic seminary often seems to have less stability than these Sulpician-inspired Anglican centres, which embodied a monastic spirit (to a greater or less extent, from Kelham and CR to SSH), but conscious of the requirement of diocesan priesthood. I have often thought that with our clergy numbers it would be easily possible to establish CMP-style houses for our parishes, not least to provide the necessary personnel for the more solemn celebration of the sacred liturgy, helping to make ordinariate parishes to centres of liturgical excellence that they could so easily be. Food for thought; thank you. Yes, an excellent article, thank you, as always, Father. “the humour of the absurd” – so important in the midst of life’s difficulties. Father Bradley’s comment is also helpful. I find the only way I can cope with my (fairly demanding) job is the regularity of prayer; it is the only ‘quality’ that is constant in my prayer. Sulpician methods are much underrated in our time. My deeply sacramental Methodist minister grandfather was shaped by regular retreats at Kelham. We played with some wooden toys that had been made by ?Br Edward/Edmund. I’m fortunate to have inherited the photo of the Kelham Christ which hung over Grandpa’s desk. My father was at Kelham for two years in the late 1950s. He left and then became a catholic. Sadly he passed away very recently; a lovely kind humble man with an inspirational strong faith. I found your post really interesting, as I was trying to imagine what his life would have been like at Kelham all those years ago – thank you. I wonder if you have ever been to Kelham? It is still open as a Local Authority offices. It is still possible, I believe, to have guided tours. The one area which has had a lasting impression on me is the Great Hall which used to be the Chapel. The huge brick arch is still there. 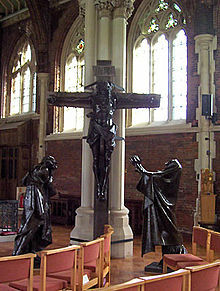 The famous Kelham Rood used to sit atop this. Do visit if you have the chance.